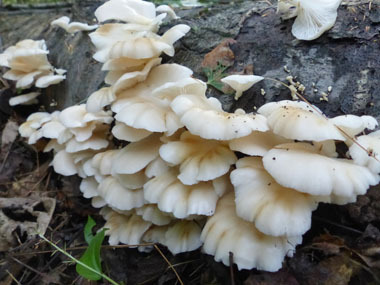 Overview: This mushroom is close relative to the King Oyster mushroom. 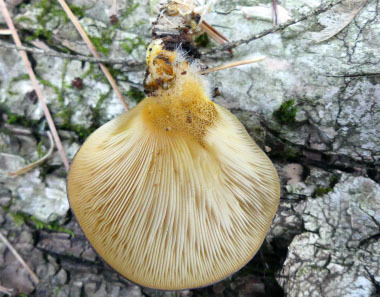 The Japanese call it Hiratake, which means the ‘flat mushroom’. 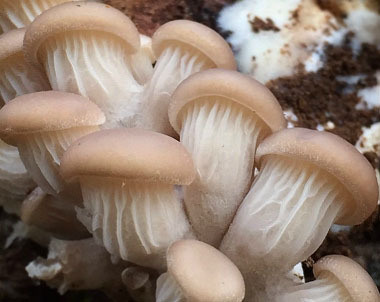 Amazingly, the oyster mushroom is also carnivorous with its victim being the nematode, an animal that is itself parasitic. 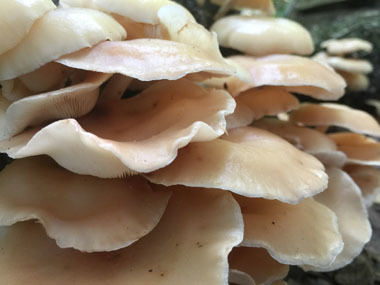 Distinguishing Features: Oyster mushrooms have a white to light brown to a darker brown, funnel-shaped cap, with whitish- yellow gills running up a short off-center stem. The flesh is white. The cap is usually 5 to 25cm (2 to 10”) across and it grows in a shelf-like formation often with overlapping clusters. Gills are white and decurrent. The stem is very short, stout, lateral, and they are somewhat hairy near the base. Height: Stalks are short and stout measuring 2.5 to 10 cm (1 to 4 inches). 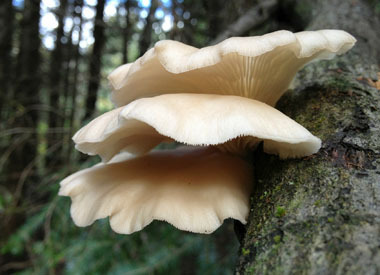 Habitat: Oysters are saprotrophic so they are found growing on logs, or on unhealthy or dying trees. They are commonly found on deciduous hardwoods, especially beech and aspen trees. They are rarely found on conifers as well. They can be found in forests in sub-tropical and temperate climates. Spore print: White to grey or slightly lilac grey. Season: Summer and autumn, or in warmer climates they can be found in winter as well depending on geographic location. Gills: Decurrent gills that are close. Whitish or with a gray tinge and sometimes yellowish when aged. 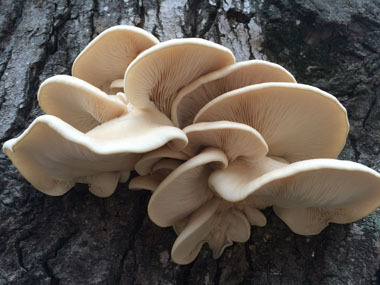 Edibility: Oyster mushrooms have a delicate, mild flavour with a velvety texture. Can be eaten raw or cooked although raw means that it probably won’t digest properly. Many thanks to Keara Giannotti, owner of Camp Creek Run in New Jersey for supplying the image of the young oysters..